One of my first Nurturing Thursday entries, which I posted almost two years ago, was about the benefits of having a fruit bowl on my kitchen table. I wrote that I always kept it filled with my favorite varieties of fruit as a symbol of abundance, a reminder that the kitchen table is not a junk shelf, and a prompt for healthy eating. This year I’m still using the fruit bowl, but I have realized that it’s much healthier to eat a wide variety of foods instead of always buying the same ones, so I’ve made a point of switching things up. 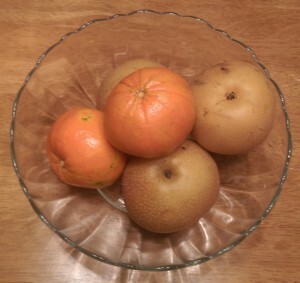 At present, the fruit bowl contains Asian pears and large mandarin oranges. Making small changes to our routines is healthier not only with food, but also with life in general. It’s all too easy to get stuck in a rut, always doing the same old stuff out of inertia or because it seems more comfortable. And then, before we know it, our creative energies have gotten malnourished. Although it’s perfectly natural to have favorites—both in what we eat and what we do—it’s also important to make sure we get plenty of variety! Hi Meg, I keep a fruit tray on my kitchen counter too, I go according to the season, but I always keep bananas and apples, the kids know they should first eat the fruits and then the chocolates and candies that I keep inside the cupboards. Changes are good for the body and the mind. We have a fruit bowl too, but it mainly gets the same things all the time like you said. I think this week I will have to change it up 🙂 Good post and love both pears and oranges! Have you ever tried a lemon drop? 🙂 It is a cross between honeydew and some kind of lemon fruit, it is really good! Never tried it, but it sounds yummy!